Two Democratic-Republican Congressmen from Virginia share criticism of Jay’s Treaty, admiration for the spread of the French Revolution to the Netherlands, and updates on recent elections. JAMES MADISON. 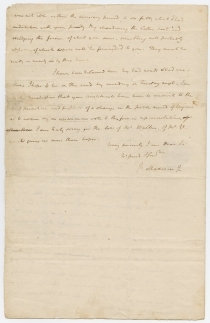 Autograph Letter Signed, to William Branch Giles, April 3, 1795, Philadelphia, Pennsylvania. 2 pp., 8¼ x 12¾ in. I was not able within the necessary period to do fully what I had undertaken with your privity. By abandoning the latter part, and abridging the former of what you saw, something will probably appear, of which copies will be forwarded to you. They must be ready or nearly so by this time. I have been detained here by bad roads & weather. I hope to be on the road by monday or tuesday next. I see by the newspapers that your constituents have been so uncivil to the hired preachers and prophets of a change in the public mind of Virginia as to adhere by an unanimous vote to their former representative. I am truly sorry for the loss of Mr. Walker. Of Mr. V. report gives us more than hopes. 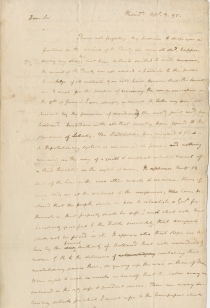 In this fascinating letter, Madison reflects on Jay’s Treaty, formally called the Treaty of Amity, Commerce, and Navigation, Between His Britannic Majesty and the United States of America. The treaty was signed in London on November 19, 1794, but it was not submitted to the Senate until June 1795. The debate over the treaty led to the formation of the Democratic-Republican Party and the First Party System. Madison led the opposition, fearing that closer ties with Great Britain would promote aristocracy and undermine republicanism. Alexander Hamilton, no longer Secretary of the Treasury, led the Federalist movement to have the treaty approved. Madison argued that the treaty could not take effect unless it was also approved by the U.S. House of Representatives, since it regulated commerce and exercised legislative powers granted to Congress as a whole. Despite his popular title as the “Father of the Constitution,” Madison lost this debate, and the House left ratification to the Senate. On June 24, 1795, the Senate ratified the treaty by the minimum required two-thirds vote, 20 to 10. Madison also reflects on changes in the Netherlands. William V (1748-1806), Prince of Orange and the last stadtholder of the Dutch Republic, had recently fled and was living in exile in England. He was unpopular in the United States because of his (pro-British) neutrality during the American Revolution. In January, 1795, French armies and exiled Dutch revolutionaries overthrew the Dutch Republic. The new Batavian Republic became a client state incorporated by Napoleon Bonaparte into the French Empire in 1806. Madison is hopeful that Abraham B. Venable (1758-1811) will also be reelected. Democratic-Republican Venable gained a large victory over two competitors in the spring 1795 elections. However, Democratic-Republican Samuel Jordan Cabell (1756-1818) defeated fellow Democratic-Republican Francis Walker (1764-1806), though both Madison and Jefferson preferred Walker to Cabell. James Madison (1751-1836) was born in Port Conway, Virginia, and graduated from Princeton University in 1771. He entered politics in 1776 and represented Virginia in the Congress of the Confederation from 1781 to 1783 and again from 1786 to 1787. Madison played a major role in the 1787 Constitutional Convention, for which he later became known as the “Father of the Constitution.” He authored the Federalist Papers along with Alexander Hamilton and John Jay. 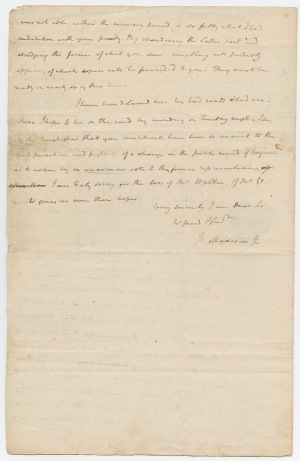 Madison helped found Thomas Jefferson’s Democratic-Republican party in opposition to Hamilton’s financial proposals. Madison represented Virginia in the U.S. House of Representatives from 1789 to 1797. Madison’s served as Jefferson’s Secretary of State (1801-1809), and then succeeded him to the Presidency for two terms (1809-1817). Madison’s administration saw the culmination of Anglo-American tensions that resulted in the War of 1812, which officially began on June 18, 1812, and concluded with the Treaty of Ghent on December 24, 1814. The last years of Madison’s second term saw the transition to the Era of Good Feelings, as the Federalist party declined. When he left office, Madison retired to Montpelier, his tobacco plantation in Virginia. He also assisted Thomas Jefferson in the establishment of the University of Virginia, where Madison succeeded Jefferson as rector when Jefferson died. William Branch Giles (1762-1830) was born in Virginia and graduated from Princeton University in 1781. He studied law with George Wythe and at the College of William and Mary, gaining admission to the bar in 1786. First elected to the U.S. House of Representatives in 1790 to fill a seat vacated by the death of a member, Giles served until 1798 and again from 1801 to 1803. He was a Democratic-Republican and strongly supported fellow Virginians Thomas Jefferson and James Madison. From 1804 to 1815, he represented Virginia in the U.S. Senate. He was the governor of Virginia from 1827 to 1830. 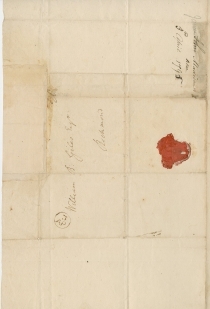 Fine, with repaired paper loss to a blank area of the integral address leaf.